The SHO!MaxiRock is a flared floor long skirt. The gathering below the waist band makes some nice pleats and a decorative ribbon gives it a unique look. An elastic band, that is pulled through the waistband hold it securely at your waist and it is very easy to sew with out a zipper. You can choose between two different kinds of back - either a wide one, that is gathered at the top like the front or a more narrow one with two tucks. As a result from the pattern testing I can say, that all girls got along well with their regular size. You can use the measurement chart on page 3 as a reference, helping you to decide on a size. 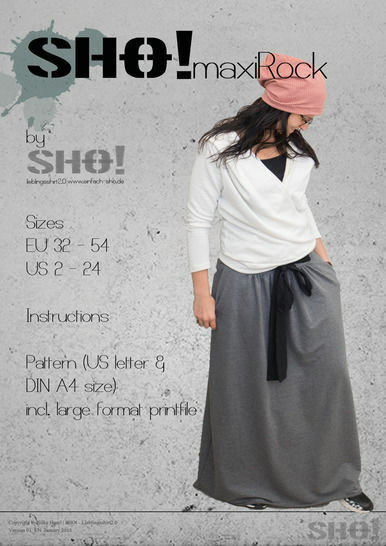 I recommend to use jersey, summer sweat, sweat, knit and all other thin knit or stretchable fabrics.